Buckthorn: How can a shrub be so harmful? European buckthorn (also called "common buckthorn" or just "buckthorn") is a tall, understory shrub brought to North America in the early 1800s as an ornamental shrub, primarily to serve as hedges. But this woody plant escaped from yards and landscaped areas long ago, invading forests, oak savannas and other natural areas. Buckthorn is extremely hardy and able to thrive in a variety of soil and light conditions. 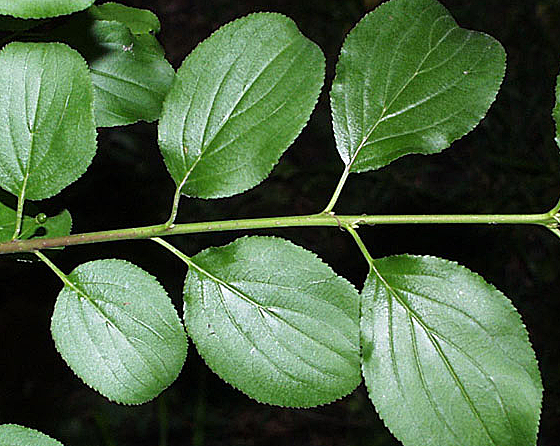 It also out-competes native plant species with its fast growth rate and distinctive phenology — buckthorn leafs out earlier in the spring and holds its leaves later into fall, allowing it to continue to grow when most native species are dormant. Buckthorn also has few predators. Look closely at a buckthorn leaf and you'll rarely see any spots or small holes. It has no specific insect predators in North America. Deer also avoid it, instead munching on native species and furthering buckthorn’s competitive edge. Combine these characteristics with this shrub's plentiful seed production and it's not hard to see how it can very quickly dominate a forest or other natural area. To us humans, a glen full of buckthorn just looks like a lush sea of bright green leaves. But to butterflies, bees and insect-eating birds, it's the equivalent of a barren desert. While birds (and sometimes mice) do eat buckthorn berries, it's often because it's the only available seed source. But buckthorn berries are not a good food source. They're low in protein and high in carbohydrates and produce a severe laxative effect in some animals. For smaller birds, the laxative effect can even be strong enough to result in death. Adding insult to injury, the excreting birds also end up distributing the buckthorn seeds over long distances. Buckthorn is known for its bright glossy leaves, which stay green late into fall long after most native plants have gone grey. Other negative effects stem from buckthorn’s leaves. High in nitrogen and calcium, they are very palatable for decomposers like earthworms. Once they fall to the ground, they decompose very quickly and create boom and bust cycles for microbes and other decomposers. Buckthorn also alters the soil. Soil under buckthorn has higher nitrogen levels, which can encourage the growth of disturbance loving, weedy species such as invasive garlic mustard. Buckthorn may even have a facilitative relationship with invasive European earthworms. Finally, because buckthorn shades out and out-competes native groundcover plants, it's bad for water quality. Native groundcover helps stabilize soil and retain and absorb rainwater. Without these native plants, rain will quickly wash over exposed, bare soil (like that under buckthorn bushes) and into nearby bodies of water. This increases erosion of the River Gorge, lakeshores and streambanks. In many cases, as the rainwater travels it picks up pollutants: bits of asphalt shingles from our roofs, fertilizer from our yards, oil from the street etc, and then dumps it all, unfiltered(! ), into the Mississippi River. Volunteers do not need to learn about removing this invasive before helping to remove buckthorn at a habitat restoration event. FMR staff will provide a complete overview and brief training as well as all tools. 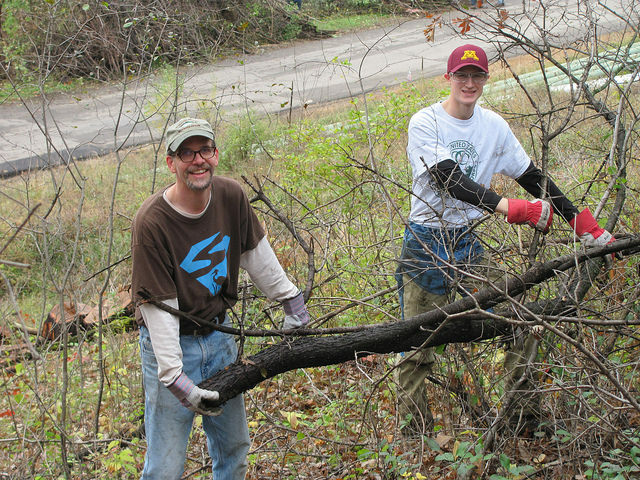 Most event listings specify whether volunteers will be pulling seedlings, using loppers or weed wrenches, or hauling pre-cut buckthorn. Some events are a mix of these activities and event staff will make sure each person has a task they're comfortable with. Also, when tool use or terrain make the event unsuitable for young children, this will be noted in the description on the events calendar. The information below is intended to provide an overview for those who enjoy learning about local ecology or who are wondering if they or someone they know has buckthorn in their yard and, if so, what they can do about it. It is a tall, understory shrub, or small tree, reaching up to 20' in its maturity. The base of the shrub often contains multiple stems and its bark is extremely flaky. Nicking the bark will reveal an orange cambium or inner tissue distinctive to this species. The leaves are arranged alternately, though sometimes oppositely, bearing a broadly elliptical shape and tipped at the end. The sides are finely serrated, or small toothed, and the texture is waxy. Because buckthorn leaves remain green even into late autumn, they are perhaps most easily recognizable at this time. The City of Burnsville has an excellent buckthorn identification page, along with removal tips. For removing seedlings and smaller, younger buckthorn plants, simple hand removal works quite well. Pliers or a small shovel may also be used. With immature seedlings, roots are not yet deep, so it should be fairly easy to get the job done. Remember to shake the soil free from the roots so smaller plants can detach and decompose. If you have both large and small shrubs, start with the larger ones as they will produce seed-bearing berries. For larger shrubs, simple hand-removal techniques will not suffice. You'll need a Weed Wrench for any plants with a "trunk" 0.5-2.5 inches in diameter (depending upon conditions). The Weed Wrench is easy to use. You clamp it tightly to the exposed stump and then pull back from the top, ripping the stump and roots from the ground. A youtube video of Russ Henry of Giving Tree Gardens in Minneapolis is available here. Last we checked, you could rent Weed Wrenches in the Twin Cities from Crown Rental, Reddy Rents, Hejny and Highway 55 Rental. There are probably many other rental places out there, and you may also try your local community group or city forester to see if they have a loaner program. Weed Wrenches aren't ideal for areas with loose soil, slopes and native plants. In these cases, a professional crew may be needed to use other control methods. 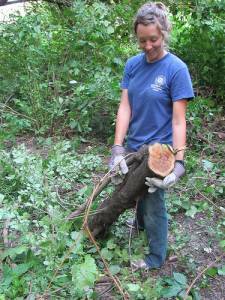 Destroying the evidence/getting away "clean"
Disposing of buckthorn brush can be tricky. 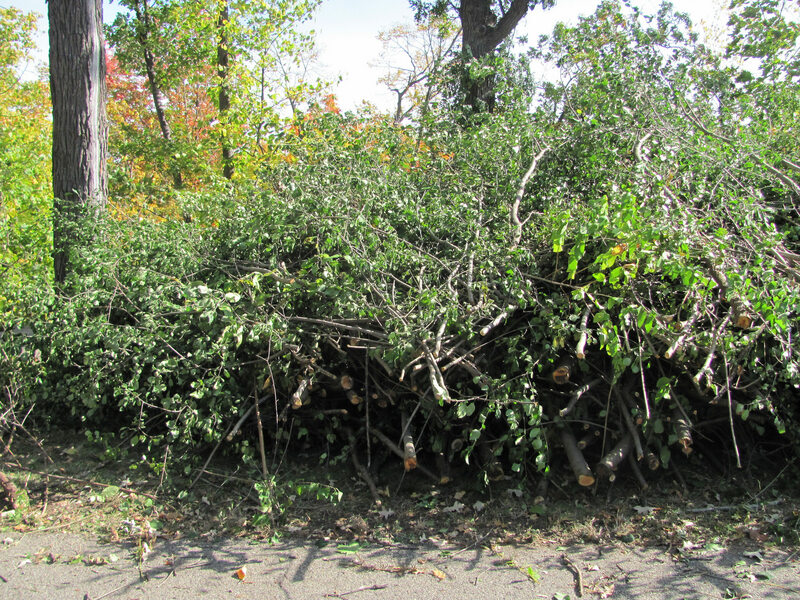 If you're removing buckthorn on your own property, contact the city for details about burning permits or get in touch with your waste hauler and inquire about woody brush pickup processes. If the steps listed above are properly followed, the chances for successful buckthorn removal are high. However, because each buckthorn berry contains up to four seeds, seedlings may reappear despite your vigilance. It's best to revisit the site to check for seedlings. It takes some effort, but persistence pays off. Many FMR restoration sites, including the beautiful oak savanna in south Minneapolis (a River Gorge Stewards site), were once buckthorn thickets and now provide excellent habitat and help improve water quality throughout the watershed! 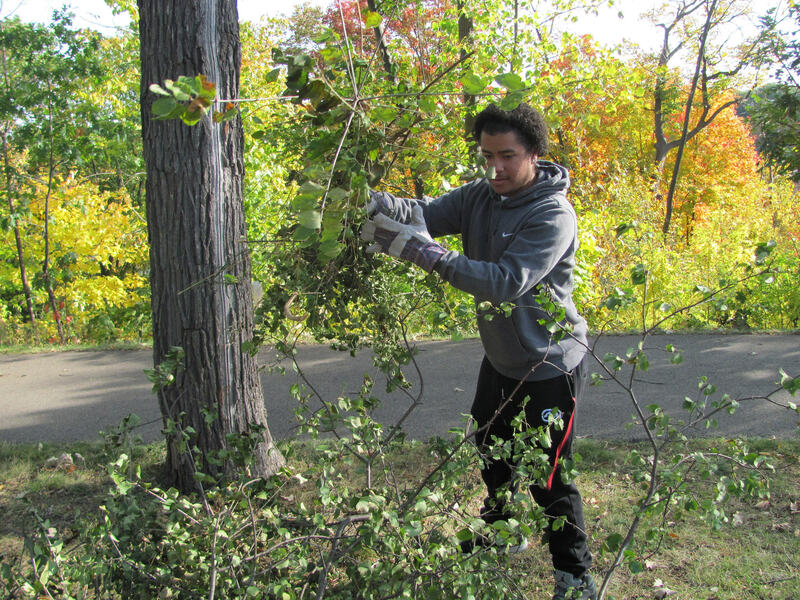 For further information on how to tackle buckthorn in your own yard, visit the Minnesota DNR. 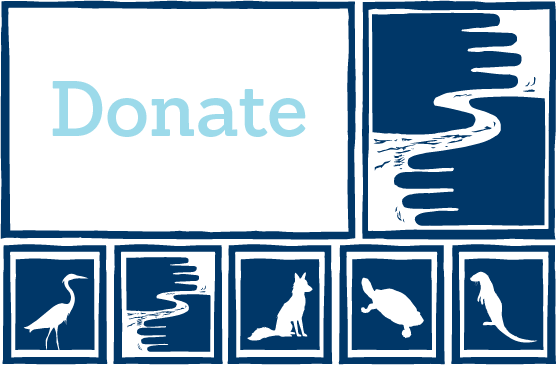 You may also want to check in with your community organization, neighborhood group or local watershed district about the possibility of assistance or matching grants to replace the invasives with watershed-friendly native species. Some cost-sharing programs are listed in FMR's Landscape for the River guide.